At this Journal Club it was decided to review a historical paper on the pathophysiology underlying autoimmune neuromyotonia. The paper, “Autoantibodies Detected to Expressed K+ Channels Are Implicated in Neuromyotonia”, from Annals of Neurology (1997, 41:238-246), used a novel technique that depended on knowing the gene for the suspected antibody target protein, in this case a potassium channel. The purpose of choosing this paper was partly to highlight how the known range of antibody mediated neurological disease has grown hugely over the subsequent twenty years, and partly to illustrate how positive findings can sometimes be seen in retrospect to have arisen through a degree of serendipity. Acquired neuromyotonia is now known to be one of a number of neurological conditions that arise through auto-antibodies interfering with voltage gated potassium (KV) channel function. Interference with resting potentials and membrane recovery after action potentials in peripheral nerve results in continual high frequency discharges and continuous muscle activation as cramp, fasciculations and neuromyotonia. Sometimes this can be precipitated by cold, exercise or voluntary muscle activation. Other features included in the spectrum of KV channel auto-immunity include autonomic dysfunction, seizures, psychiatric disturbance and limbic encephalitis. When resulting in a neuropathy and neuromyotonia, the term Isaac’s syndrome is often used, while a presentation of neuromyotonia with autonomic or CNS involvement is described as Morvan’s syndrome. The techniques used by Hart et al inferred that there would be an affinity of patients’ antibodies for the Kv channel, as it was already known that acquired myotonia results from disturbances of Kv channel function. If there was a known toxin for this channel, as with bungarotoxin for nicotinic acetyl choline receptors, this could be used as a labelled high affinity ligand and form the basis for a radioimmunoassay for detection of circulating antibodies against the channel. Dendrotoxin is a highly specific and high affinity toxin, but binds only a cohort of potassium subunits (Kv 1.1, 1.2 and 1.6). Verification that the Kv channel rather than other dendrotoxin-bound material from solubilised brain was provided by demonstrating binding of neuromyotonia patient antibodies to dendrotoxin-bound Kv1 subunits expressed in Xenopus toad oocytes via cRNA after complementary RNA expression. Knowing the gene for Kv1 enabled production of the complementary RNA. Expression of this in the toad oocyte meant that the KV1 protein would now be present in pure form. In this experiment, 4/12 samples were positive of the neuromyotonia cohort (and again, 0/18 controls). This positivity rate was felt to be consistent with the fact that human disease antibodies might be to subunits other than Kv1. The authors offered no information on the correlation between titres on the human brain assay and Xenopus expression system. The authors then turned to immunohistochemical staining instead of immunoprecipitation. In this assay, antibodies labelled with horseradish peroxidase stain are created that bind to immune complexes. Thus any patient serum anti-Kv channel antibody that has bound to Kv1 channels expressed on the toad oocytes will in turn be bound to by the staining antibody-binding antibodies. The oocytes are then looked at under a microscope. They found positive staining of serum added to different Kv subtypes but not to a number of controls. However, since the oocytes had been fixed, permeabilised and sectioned prior to incubation with patient antibody, one could not confirm that the KV1 channel had actually been expressed on the membrane surface as it would naturally in human neurones. They suggested the technique could be applied to many other putative antigens for pathogenic circulating antibodies, provided the genes for the antigens were known, which is the case for most proteins now. In another experiment to check for antibody binding to potassium channel subtypes for which dendrotoxin is not a ligand, these Xenopus cells were incubated with sulphur labelled methionine at the time that they were injected with one of three different Kv complementary RNAs, so that when they expressed the channel protein, it would be radiolabelled by the incorporated methionine amino acid, and detectable with autoradiography. The serum of neuromyotonia patients and controls was applied to these preparations and anti-human IgG was used to determine patient antibody-bound Kv material. However, this precipitant did not reveal any labelling with either patient or control serum. The authors suggested that this may be because the antibody binding is conformationally dependent, a feature that somehow did not apply when dendrotoxin had already bound in the other assay. Alternatively, it could also reflect that Kv channels are not really the antigenic target in neuromyotonia – an explanation which has subsequently been confirmed in more recent data. Since this paper was published, as mentioned in the background, a more extensive spectrum of disorders associated with potassium channel antibodies has been described, but unfortunately there appears to be no specificity linking disease phenotype to antibodies to particular Kv subunit combinations. More recently still, the antigenic targets of these antibodies have been clarified to be proteins associated with the potassium channel rather than the channel itself. So the antibodies were not what they were purported by the paper to be after all! It is not surprising therefore that the experiment with directly methionine-labelled subunits yielded negative results. It is not clear why the authors thought the naturally occurring pathological antibodies would bind to a channel better when it had toxin attached to it. But it is also now not clear why the immuno-histochemistry labelling of Kv1 expressing oocytes was positive in some cases, as the actual antigen in most cases was absent. Only in a small minority of neuromyotonia cases have the newer assays demonstrated that the Kv channel proper (and not an associated protein) is the true antigen. In fact, since 1997, the radioimmunoprecipitation assay by which these antibodies are detected remains largely unchanged from that used before the advance that the paper was supposed to introduce: rodent brain is used as the substrate of Kv channels and still labelled with dendrotoxin. So, since the toxin binds only a small proportion of all Kv channels, there are likely to be many cases of antibodies against other Kv or Kv-associated antigens that are currently undetected by current methods. There is significant scope for improvement in these assays, in terms of range of antigens tested, cross-assay standardisation and, importantly, timescales of test to result. It was discussed in the journal club how this currently significantly limits appreciation of the potential scope of antibody mediated neurological diseases. This case was presented and summarised by Dr Sian Alexander, Specialist Registrar in Neurology at Queens Hospital, Romford. 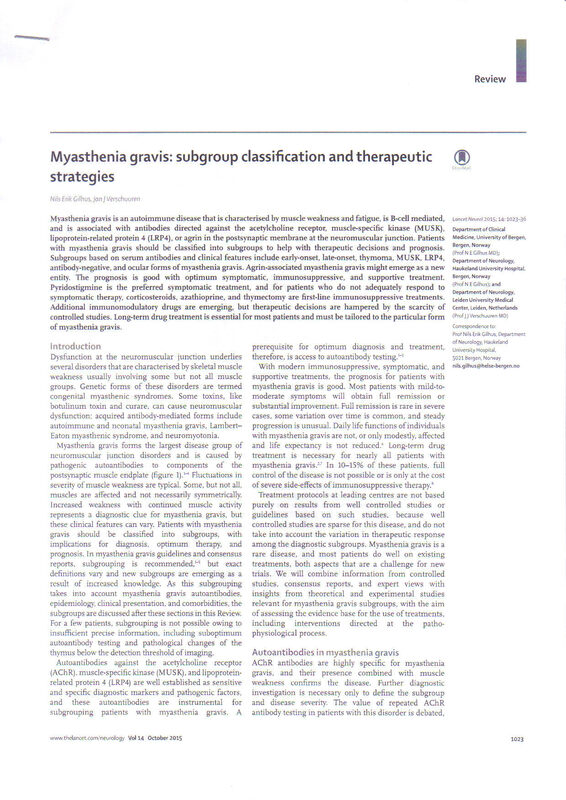 Myasthenia gravis (MG) is a neurological condition characterised by a fatiguing weakness of certain muscle groups, particularly those that control eye opening, eye movements, speech and swallowing When severe the proximal muscles of the limbs and respiratory muscles may be involved. Acquired myasthenia is an autoimmune disease, where antibodies are directed against the post synaptic nicotinic acetyl choline receptors (AChR) of neuromuscular junctions or against other proteins that affect AChR function. Diagnosis and appropriate management of MG is particularly important because at any time it can transform suddenly from a relatively benign condition of ptosis and diplopia to a crisis with potentially fatal bulbar dysfunction and respiratory failure. These latter symptoms may in turn reverse with prompt emergency supportive care and immunomodulatory treatment. The discussed review in Lancet Neurology by Gilhus & Vershuuren seeks to provide an insight into the usefulness of the latest antibody assays in predicting in individual patients the clinical course of MG and response to therapy. Evidence was gathered from the literature on the basis of appropriate searches on Medline and the Cochrane library for English language publications from 1995 to 2015. The review first describes the pathophysiology of the different associated antibodies. AChR antibodies cross link receptors, accelerating their breakdown. Muscle specific kinase (MUSK) and lipoprotein related protein 4 (LRP4) exist as a complex on the post-synaptic membrane. When activated by agrin protein, this complex affects the aggregation of AchR and the morphology of the terminal. Antibodies to MUSK, LRP4 and agrin influence this process and are therefore are likely to be directly pathogenic. Titin and ryanodine receptor antibodies occur in some patients with thymoma related MG, but may be markers of severe disease rather than directly pathogenic. Comorbidities may be present in MG, and awareness of these is important. Younger onset patients may have other organ specific autoimmune disease , including polymyositis. Thymoma associated MG is associated with increased risk of haematological malignancies and with a severe autoimmune cardiomyopathy. Early onset MG with ACh antibodies. This often has ocular involvement and has a female preponderance. Thymic hyperplasia may be present and in these cases the condition responds to thymectomy. Late onset MG with AChR antibodies. This is also often ocular, but there is only rarely thymic hyperplasia. Thymoma-associated MG. These patients usually have generalised disease and AChR antibodies. There are also other paraneoplastic associations, such as pure red cell aplasia and neuromyotonia. MUSK associated MG. These antibodies are present in 1-4% of MG cases. The condition is usually bulbar or generalised rather than ocular and there is no thymic involvement. LRP4 associated MG. This can be ocular or generalised in presentation. Antibody negative MG occurs in 5% and is heterogenous, probably reflecting different undiscovered causative factors. Ocular MG is defined as being restricted to the ocular muscles; if this remains the case for 2 years, 90% of the time it will remain so. Half of such cases have AChR antibodies, but only very rarely do they have MUSK antibodies. When symptoms are typical, the review considers neurophysiological testing unnecessary in all cases bar those that are seronegative. Finally the review discusses treatment options. Immunosuppressive treatment is recommended when symptomatic treatments (anticholinesterases such as pyridostigmine) fail alone to control symptoms. (MUSK antibody associated disease often has a poor response to such treatment.) An extensive review of clinical trials reveals disappointing results in many cases when compared with placebo. Nevertheless a clear treatment plan of steroids combined with immunosuppressive drugs is recommended. Other treatment plans may vary from this. The only information regarding treatment in relation to antibody serology is that rituximab in uncontrolled studies may be particularly effective in MUSK associated MG. The review concludes with a discussion of new treatments, such as other monoclonal antibody therapies targeting autoantibodies, or antigen specific treatments that encourage the development of immune tolerance. The review provides a welcome revision of management in an important therapeutic area. However it was felt that there was little specific information on serological-clinical correlations that practically affect management. This was the presumed main hypothesis of the review. The lack of ocular and thymic involvement in MUSK associated disease, and its poor symptomatic response to anticholinesterases, were interesting points. The lack of evidence base for treatment compared to the clear benefits observed in practice does point to the limitation of relying solely on evidence based medicine. It was conjectured that in some cases this may reflect patient selection. If for example, all ocular myasthenic patients are started on immunosuppression, in many cases it may be unnecessary and so demonstrating an improved response compared with placebo may prove difficult. Perhaps clinical focus is understandably upon patients with myasthenic crises or who have recently had myasthenic crises, where the response to treatment is more dramatic and clearly in some cases life-saving. The indication in the review that neurophysiology was only necessary in seronegative patients was surprising. In our practice, we often have neurophysiology results before serology becomes available. In patients with ocular symptoms only, the differential includes cranial nerve palsy, sympathetic lesions, myopathic processes and even muscle tension related symptoms. Identification by neurophysiology alerts clinicians to the fact that the patient is at risk of life-threatening myasthenic crisis. Patients with bulbar involvement may have motor neurone disease or myopathy. Finally, there is a significant false positive AChR occurrence; in patients with low positive AChR titre in whom we feel that myasthenia is actually unlikely, normal neurophysiology on single fibre EMG jitter study helps to confirm this. While not 100% sensitive and specific, neurophysiology does lend valuable diagnostic support. This paper was presented to our Journal Club by Dr Salman Haider, Specialist Registrar in Neurology, Queens Hospital, Romford, UK. It has long been known that there exist variants of Parkinson’s disease (PD), loosely and perhaps inaccurately described as PD plus syndromes, that may carry features of Parkinsonism but which also have other clinical features. Such conditions have distinct pathology at autopsy. However, it has also long been known that clinicopathological correlations of these conditions are not perfect; in other words, a patient in life may have clinical features indicating one PD plus syndrome but may be found subsequently to bear the pathology of another. The subject of this journal club, When Dementia with Lewy Bodies, Parkinson’s Disease and Progressive Supranuclear Palsy Masquerade as Multiple Systems Atrophy by Koga et al. (2015) in Neurology, is a retrospective review of Mayo Clinic brain bank cases labelled as having Multiple Systems Atrophy (MSA) in life. However some patients will have pathologically proven MSA without satisfying these criteria, while in others the clinical picture will be confused by coexisting conditions in this age group, such as Alzheimer’s disease (AD) or cerebrovascular disease. The study reviewed the autopsy results of 134 cases that had consecutively been submitted to the brain bank with a clinical label of MSA. Patients came from 37 US states. The pathological assessments were done using a standard protocol. In 125 patients there were useful clinical records, and in some cases further information was gained by questionnaires sent to living relatives. 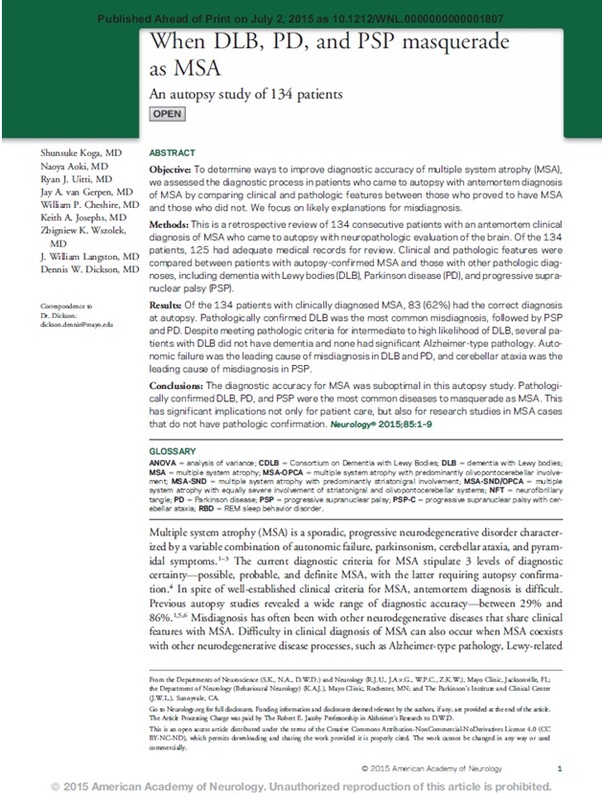 A pathological diagnosis of MSA was confirmed in 62% of cases. Of the remaining 38% of cases, 37% had Dementia with Lewy body (DLB) pathology, 29% had PSP, and 15% had PD. Two of the 134 total had Corticobasa Degeneration (CBD), two had cerebrovascular disease and five were “miscellaneous”. On retrospective assessment of clinical features according to the above criteria, only 49 patients had probable MSA and 35 possible. (But incomplete records do not mean that patients did not have particular clinical features). Once this had been done, 71% of probable MSA patients had pathological MSA, and 60% possible MSA patients had MSA pathology. The paper describes pathological changes in some detail. In the same way that there are, according to Braak, “stages” or at least grades of neurofibrillary tangle involvement in Lewy body disease, there have been described five phases of A beta amyloid deposition in Alzheimer-type disease. These range from phase 1 where deposition is exclusively in neocortex, to phase 5 where there is widespread involvement even in the cerebellum. In pathological MSA, 8% also had Lewy body pathology. Overall the median Braak stage was I (not 0). A quarter of the MSA brains had phase 1 or worse A beta phase of Alzheimer’s. With pathological diagnosis as the reference point, the features that were more common in MSA than in DLB were urinary continence, ataxia, nystagmus and pyramidal signs. Cognitive impairment and visual hallucinations were more common in the latter. Comparing MSA vs PD, incontinence was more frequent and visual hallucinations less frequent. Comparing MSA vs PSP, urinary incontinence, constipation, orthostatic hypotension and REM sleep behaviour disorder were more frequent, and vertical gaze palsy less frequent. Levodopa responsiveness and mini-mental state score actually did not distinguish these diagnoses. The main errors related to assuming that orthostatic hypotension automatically resulted in an MSA diagnosis instead of DLB or PD, and assuming that ataxia resulted in an MSA diagnosis instead of PSP. Severe dysautonomia early in the course of PD should not be considered an exclusion criterion for that diagnosis. Imaging has poor sensitivity. Only 38% of pathological MSA had imaging changes. The hot-cross bun sign was rare. There were similar rates of abnormality in PSP. As suggested by the authors, a limitation of the study is that retrospective post mortem analysis suffers from clinical signs being recorded at different stages of disease advancement and there is a selection bias in those that come to autopsy (such as atypical cases). Our feelings were that for the above reasons the study cannot be used to determine real diagnostic accuracy. The “improvement” in diagnosis from 62% to 71% when a movement disorders specialist applies probable diagnostic criteria carries little meaning, given the limited data available from those who examined the patient in life. A “brain bank” is only as good as the accuracy and detail of clinical label attached to the specimens. It was pointed out, though, that the very wide geographical distribution of specimens, which included those not from academic centres, does reperesent a cross-section of patients in the US labelled as having MSA. We wondered if the difference between PD and DLB is essentially quantitative. DLB is rather arbitrarily defined according to dementia changes manifesting before extrapyramidal changes, otherwise it is considered PD dementia. Perhaps “diffuse” Lewy body disease is a better clinical label. Pathologically there is likely to be a borderline state between the localised involvement of PD and the diffuse involvement of DLB, and indeed if the Braak hypothesis is correct, this overlap may apply to all patients at certain stages of disease progression. Our final point was a philosophical one about what is the gold standard of diagnosis. Is it necessarily always pathology, which presumably accurately reflects the pathophysiological process that led to the observed pathology? What if there is dual pathology, as reflected in a number of specimens in this study? Which supercedes the other? Is it simply relative severity? If one set of clinical features can reflect either one or both of two different pathological appearances, what is actually more important for the patient and clinician? Would we deny a patient a trial of cholinesterase inhibitor for their dementia and hallucinations if we somehow knew that their pathology was MSA or if their Lewy bodies were localised to the brainstem? Would we not treat their autonomic symptoms if their pathology was PD? Would we fail to check a clinical MSA patient for sleep apnoea if their pathology instead revealed Lewy bodies? While pathology might be the gold standard when conducting clinical trials, in normal clinical practice it is the clinical features guiding practical management and prognostication that are of primary importance. The broad clinical labels of system involvement still help to classify patients according to their present and future clinical needs. 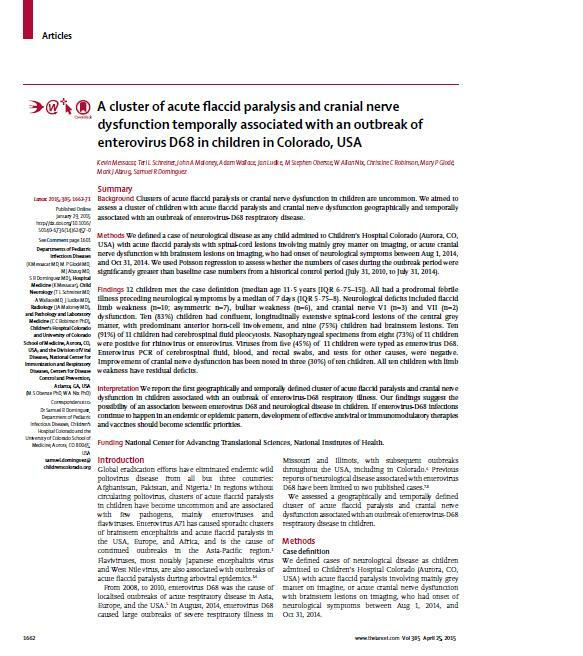 This paper was presented to our Journal Club by Dr Gemma Cummins, Specialist Registrar in Neurology, Queens Hospital, Romford, UK. Enteroviruses, which may cause gastroenteritis or upper respiratory tract infections, are well-known to have neurotropism – a predilection in a proportion of individuals to spread to certain types of neurones, thereby resulting in characteristic neurological syndromes that occur after initial infection. The most well-known example is of course poliomyelitis which results in acute flaccid paralysis from anterior horn cell involvement. More recently, enterovirus A71, causing hand foot and mouth disease, has resulted in epidemiological clusters of brainstem encephalitis and acute flaccid paralysis. Enteroviruses may also be responsible for acute viral meningoencephalitis, presenting classically with fever, meningism and obtundation, and perhaps with focal cerebral neurological signs or seizures. In fact, in our experience, enteroviruses, along with herpes simplex virus, are the most commonly identified organisms responsible for sporadic viral meningoencephalitis. This paper, by Messacar et al. in the Lancet (2015), reports cases of the latest enterovirus identified to have possible neurotropism, namely enterovirus D68. Localised outbreaks occurred between 2008 and 2010, and a large outbreak occurred in the USA in the Autumn of 2014. A cluster of cases of acute flaccid paralysis in children were identified at the same time (Autumn 2014); they presented with weakness in proximal limb, facial and bulbar muscles and radiological changes of either longitudinal grey matter spinal cord lesions and/or brainstem hyperintensities were identified. Cases were retrospectively identified from records of children admitted to a hospital in Colorado in the Autumn of 2014. Inclusion criteria were acute flaccid paralysis with mainly grey matter spinal cord involvement on imaging and/or acute cranial nerve dysfunction with brainstem lesions on imaging. In the acquisition period twelve children satisfied the neurological inclusion criteria. All but one had fever and preceding upper respiratory tract symptoms. Ten had meningism. The limb weakness, present in ten cases, was proximal with hyporeflexia and preserved sensation. A similar proportion of children had symmetrical and asymmetrical weakness. Ten had cranial nerve dysfunction, bulbar weakness, diplopia or facial weakness. None had encephalopathy or seizures. The spinal cord lesions, present in eleven children, always affected the central grey matter, especially the anterior horn cells. The longitudinal spread was from 4 to 20 vertebral levels (we commented that there were only 19 levels from C1 to T12, but younger children’s spinal cords extend a little lower). Brainstem lesions were present in nine children, mainly in the dorsal pontine tegmentum. Some children had EMG, which showed variable motor denervation, presumably indicating either anterior horn cell or ventral nerve root involvement. Spinal fluid analysis typically showed a pleocytosis (unlike typical cases of acute motor axonal neuropathy subtype of Guillain Barre syndrome) and normal or mildly elevated protein in all but one case. In five of eleven cases, nasopharynx specimens were positive for enterovirus D68. Blood and spinal fluid PCR was negative, as is commonly the case in polio and other enterovirus neurotropic infections. Polio also has a delay between initial and neurological symptoms and yet is due to direct viral spread to the anterior horn cells, so the delay after respiratory symptoms and the lack of spinal fluid virus observed in these cases does not necessarily indicate that the condition is post-infectious rather than infectious. Many of the children were treated with intravenous immunoglobulins or steroids. Some had plasmapheresis. There was no clear benefit from these therapies. Many children had lengthy admissions and significant residual neurological deficits despite treatment. The paper compared the number of these neurological cases in 2014 with average numbers of similar presentations (from ICD 9 code discharge database) between 2010 and 2014. In any previous 3 month period the maximum number of cases was 4 (significantly lower). One was positive for D68. The background epidemiological context in the paper describes a 77% increase in children with acute respiratory admissions in 2014 compared with equivalent months in previous years. It is not clear if all such cases were tested for viruses but a number were tested with a screening nasopharyngeal swab PCR array that does not distinguish enteroviruses from rhinoviruses. There was a “substantial increase” in positive results on this test during the acquisition period. Only 25 cases were actually tested for D68, and these were cases admitted to ITU with severe respiratory disease. These were positive for D68 in 76%. The paper presents a persuasive argument for a defined neurological syndrome, with the flaccid paralysis, exclusive motor involvement, pleocytosis and rather characteristic neuroimaging features. Less persuasive is the causative role of enterovirus D68. It was identified in less than half of the neurological cohort during a presumptive D68 outbreak. The background level of enterovirus D68 positive asymptomatic children during the acquisition period is unknown. The increase in neurological cases during that Autumn epidemic compared to baseline levels could be skewed by ascertainment bias and, given the sample size, a coincidental increase is always possible. Neurological D68 infection is not new. In fact a previous paper (Ayscue et al., 2014) (which this paper mentions at the end of the discussion) reported 23 cases of acute flaccid myelitis in California from 2012 to 2014, two of which were positive for D68. The lower rate of D68 identification could have reflected testing late during the illness, whereas earlier testing as in this paper is more likely to yield positive results. Nevertheless the paper does contribute to a body of evidence suggesting that enterovirus D68 is one of a group of viruses that have accounted for recent outbreaks of upper respiratory tract infections and may have particular patterns of neurotropism resulting in acute infectious or post-infectious complications. Unfortunately, as the paper identifies, there are as yet no specific and effective preventative or treatment strategies for these neurotropisms. This paper was presented to our Journal Club by Dr Sian Alexander, Specialist Registrar in Neurology, Queens Hospital, Romford, UK.